This Sunday, we had a mentoring outreach at the Cary Area Public Library. Two of our team members helped elementary aged kids build their own Lego Mindstorms robots. Kids could choose from a self balancing Gyro Boy, a cute Puppy, an amazing Color Sorter or a futuristic Robotic Arm. 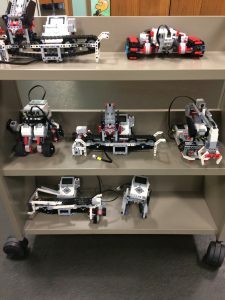 One team created a tank bot using the Mindstorms expansion kit, and, with the help of one of The Golden Ratio team members, added a “remote control” function. In total, 14 kids built 7 amazing robots! A whole lot of bots!